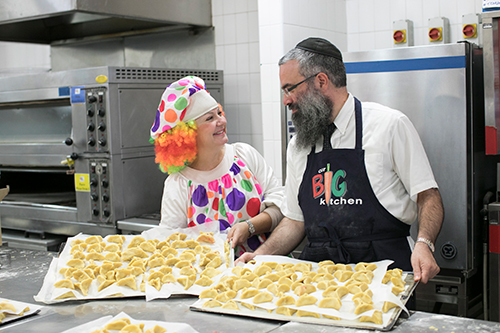 The kitchen was founded by Rabbi Dr. Dovid Slavin and wife Laya in 2005. 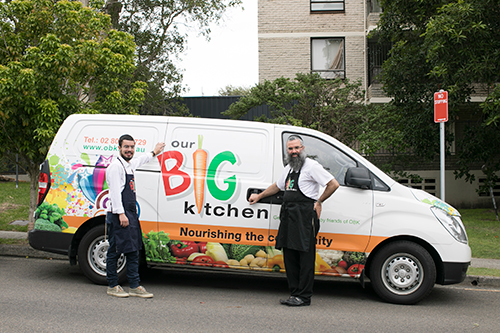 Recently he sat down with us to tell us about how the idea started and how Our Big Kitchen serves the community. During World War 2, Rabbi Slavin's mother fled from Poland to Russia. They headed Far East to Siberia, passing Kazakhstan. She had to carry her youngest brother (aged 2 ½), who was weak and hungry. In his limited Yiddish, he asked for nothing more than a piece of bread. But they were unable to find any for him, and he died of hunger. They took his body to the nearest morgue, received a docket for him and that was the last they saw of him. November marked the 76th anniversary of his passing. "When power goes to people who cause destruction, innocent people pay a big price", says Rabbi Slavin as he reflects on this. His mother has always felt guilty about not being able to do more to save her youngest brother. Rabbi Slavin asked how old she was at the time (11) and pointed out her own granddaughter is the same age and why would she expect more from herself than her own granddaughter? This was who gave birth to Rabbi Slavin, raised him and played a "huge part" in his life. Despite the tragic family history, he was raised in a positive family. "To be able to make sure we're positive, #1 we're feeding people, bottom line people are getting food, nobody's going hungry. #2, we're building a capacity in the community to respect one another, to work with one another and not let the seeds of hatred that lead to war to take hold... If we're here, we're here for a purpose." This is something front of mind for Rabbi Slavin, spurred on not by anger or bitterness, but a vigilance and a deep need to make a difference to the world. "The biggest influence in my life was a Rabbi named Rabbi M.M.Schneerson Known as the Rebee (1902- 1994), an extraordinary man born and raised inDnepropetrovsk, Ukraine. After World War 2, many Jewish survivors moved as far from Europe as possible, changing their names, not wanting to pass on the burden of Judaism to their children." After the previous decade they'd endured, they'd had enough of anti-Semitism and so they abandoned the religion. 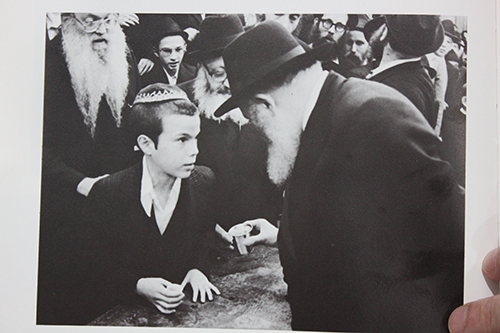 In light of this, Rabbi Schneerson had a passion to see young Western boys (from countries like the UK, USA and Australia) embrace the religion of their ancestors and want to share it. So the Rabbi shared the product, richness, energy and beauty Judaism possessed, all it had given their community and the world for centuries. "He was a giant of a man, dedicated to making the world a better place". 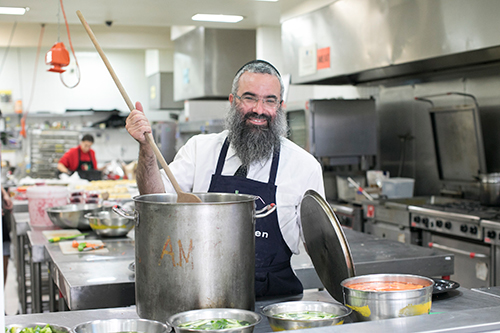 For Rabbi Slavin, this kitchen is his expression of such a passion. "We can take broken pieces of food and then people are meeting, hungry people are being fed and food is going to hungry people instead of landfill". Rabbi Slavin believes he and Laya make an effective team because "she's full of passion." After they married in 1991, they headed to New York City, where he studied and then, when their eldest was born, Laya wanted the baby raised in Australia where her family was. 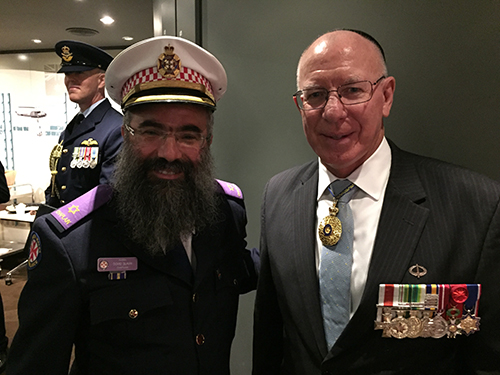 So he came to see what was happening in Australia, began working as a teacher then a short time later he took over the management of a rabbinical training program. He was in this role for many years and that took him into academia, going to Sydney University and getting his PhD. looking into the history of the Jewish people in pre-war Europe. It was then (thanks to Laya) he moved into humanitarian work across the community. She had been sending food to people since the late 90's, and their first donors were old people who donated in kind. "Australia has been a lucky country. Good people. I've always found they want to help, but sometimes they need a little help in seeing what's the best way to do it. I felt I could facilitate that- build it and they will come- that's how the kitchen was born." OBK operates by a philosophy of bringing different people together who want to contribute in some way or another, from all different cultures and backgrounds. "Take the time, talk to somebody and in a second you can link it to what you're doing. Everything comes back to food. You could have a relative who's incarcerated or an elderly person or somebody suffering from a mental illness with special needs. It's no longer my kitchen but their kitchen. It's not based on what's important to me, but what's important to you." "It's the most important thing for it to be relevant. If it's not relevant, as nobody cares about your problems." The business model is set up so that the kitchen attracts all kinds of volunteers, rather than just big school groups and corporates. Rabbi Slavin didn't want to take the easy, profit-focused route whereby corporates would come in, cook, pay and make money for the kitchen. He instead wanted a place where a special needs person should feel welcome, where single people come together ("We have singles nights, we get 15 guys and girls in and at the very least they get to cook for someone. But meetings happen...") a place where people who want to start a business could feel like they had somewhere to go. What he wants is to bring people together. "Go to the kitchen there's no plaques on the walls- this is all a labour of love. People themselves had something built that they feel talks to them." For a charitable organisation, Rabbi Slavin is committed to ensuring that everything is done following a process easy for new volunteers to follow. Recently, the logistics team from Johnson & Johnson came in to help simplify their processes, agreeing to break down every task carried out by OBK. "If you don't have a simple way to explain things to volunteers, they won't come." OBK has many supporters, much of it owing to Rabbi Slavin's ability to get businesses big and small onside with his vision. One such example was in relation to a Jewish calendar that Yeshiva College had printed and distributed to its students for years. When he took over the fundraising for this, Rabbi Slavin could raise money for the calendar, although "not easily". The calendar was given to an outside publisher with the arrangement that he'd give the school 10% of the advertising profits and print it at his cost. He'd put as many ads as he wanted in and give the school its' calendars. From there, the school would send the calendars out and ask for donations. But the Rabbi wanted to not just get a better deal for the school- he wanted to get the calendar printed for free. 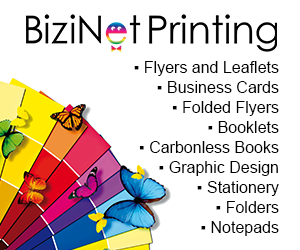 So he found a graphic designer to create the calendar, contacted other companies for the ink and the paper, then made a list of printers to enquire at. After being dismissed by others, he went to Diamond Press, owned by JohnSpira. 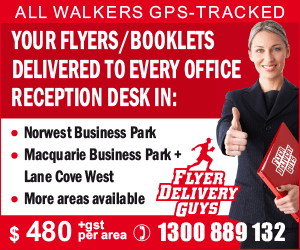 At the time, Diamond Press was one of the biggest printing agencies in the country, behind only Packer and Murdoch. The secretary got Rabbi Slavin a meeting with Spira, who was quite reluctant to meet at first on the premise of printing the calendars free of charge. "I'm giving you 5 minutes then I'm throwing you out", he said. "So I came in with the calendars and said I have the ink, I have the paper and I have the paint. I want to make it really easy for you. I'll never forget it. He grabbed the calendar to look at the thickness of it and the paper, I knew I had a deal. He said yes and I threw out my hand, gave him a hug and a kiss. I was so excited!" "That's what I've always done- you get the right person and then you become their arms and legs and bring in more people if you understand what they're doing. I just want people I can bounce ideas off." As a current example, supporters of OBK include NetSuite (licensing and implementation) and Oracle (a company running operating systems for banks, government and billion dollar corporations). A couple of years ago, Oracle saw opportunity in ERP (Enterprise Resource Planning) a program that runs an entire business, managing all components- finances, CRM, stock control, etc. all at once. NetSuite had the software and Oracle bought them for $9.5 billion. Such a comprehensive program is expensive. Rabbi Slavin asked around to find out what system would work best for managing OBK, then went to NetSuite and pitched to them. Impressed, they gave him the licensing to use the system. Yet again, there were other problems to solve, with the implementation of such a system being a typically long and difficult process to set up. To make it easier for NetSuite, Rabbi Slavin brought in people from outside (like universities) to help them. 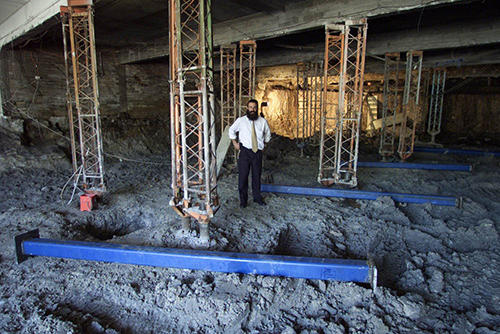 With their resources, the Rabbi brought in layers of support to make their task easier. "I would credit NetSuite for bringing in a several hundred thousand dollar implementation. The reality is, I made sure it should cost them as little as possible by bringing in as much support to them as I can, at no extra cost." 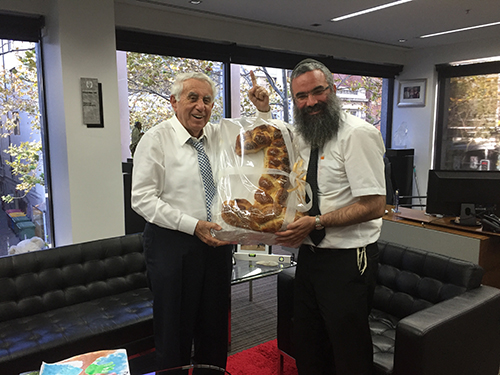 Another supporter of OBK is Mr Harry O. Triguboff AO, who Rabbi Slavin met some years back when he was involved with the program at Yeshiva College training young men to become Rabbis. OBK stands on the same grounds as the College and the synagogue, and in 2012 Triguboff approached the Rabbi, telling him the school wasn't doing well financially. He asked if Rabbi Slavin would take over the running of the school and the centre, believing that together, they could salvage the grounds from financial turmoil and create something positive. 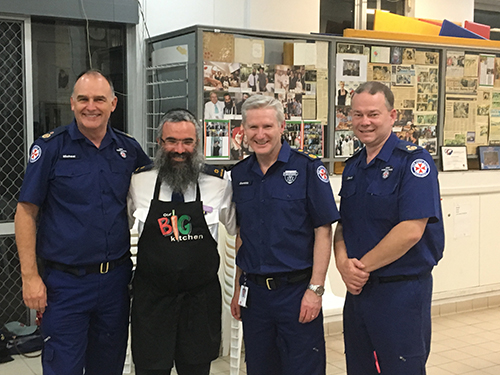 But the Rabbi was happy managing OBK, serving as a Chaplain to the NSW Ambulance Service, working with the Cancer Institute and recruiting to the bone marrow donor agency through Gift Of Life. "My hands were full". Triguboff left him alone for a week- then came back, trying to persuade him again. So Rabbi Slavin spoke to the others involved, to find out what would be required- but again declined the offer, and so Triguboff let him be. "Harry works very hard and he expects no less from those who work around him. He saw me up-close, liked (the attitude) he saw and felt I could do better in the running of the college. I sent my kids there, paid my fees and that was it, I was happy to let somebody else run it. Then in August 2012, the school was on the verge of imploding- and that'd take the centre and the kitchen with it. Harry offered to find me a new premises for the kitchen, but I wanted it to remain as part of the center". For Rabbi Slavin, it was important for the kitchen to be part of a bigger, Jewish organisation, as it's something "close to his heart". He wanted an organisation doing things that were positive, with the Jewish community getting credit for it. At the same time, he wanted to focus just on the kitchen, even if Triguboff wasn't pleased with the school or the centre. Yet, come August 2012, with the creditors on the doorstep, Rabbi Slavin met with Triguboff (as they usually did twice per week) and they reached an agreement: financial control would go to the Rabbi, backed by the schools' board. Triguboff met with the creditors,he announced he'd step in to buy the property and settle its debts. So now they own the land and control the school, the synagogue and OBK, while Rabbi Slavin is the Director. "The world today basically works as: I have a job, I have an income, the income buys me my roof, clothing, friendship, status, entertainment. And when that job moves away, everything else falls apart. I've seen that happen in frightening ways." "If it can happen to him, then nobody in this country is safe. There's nobody who can't take a very big fall. As people, we can go through anything together. There are very few people who are able to withstand the pressure on their own. The Winston Churchill's of this world are very few and far between". Speaking of his own experience with the day-to-day running of OBK, Rabbi Slavin mentions the difficulties involved: "There's a lot of lonely nights, lonely days, a lot of expectation and disappointment. You can choose to focus on it or not to focus on it. I choose to focus on the positive. If my mother lost a brother to starvation and I have a fridge full of food here, a fridge full of food at home- fridges wherever I want- what do I have to complain about?" Schools in the area have used OBK as a venue for the traditional Year 12 "Muck Up Day"- and that comes with a lesson. The students come in and create meals, before taking them back to their school to put on a lunch for the staff. "Part of being grown-up is our ability to contribute- and we want to start with (the staff). For young people wondering if they're needed in this world, this is their opportunity to see that they are needed. That's what they try to do here, on many levels." The Rabbi is open to constructive criticism of the kitchen, but he also wants partnership going forward. Everybody who is involved in the kitchen has a distinct way in which they contribute- whether it's through cooking, talking with people or just listening and being present. "If somebody can come in for a few hours, help prepare a meal and see the appreciation- that's a winner. Everywhere you look there's opportunities to use peoples' time, talents and give it in a meaningful way to people who need it." 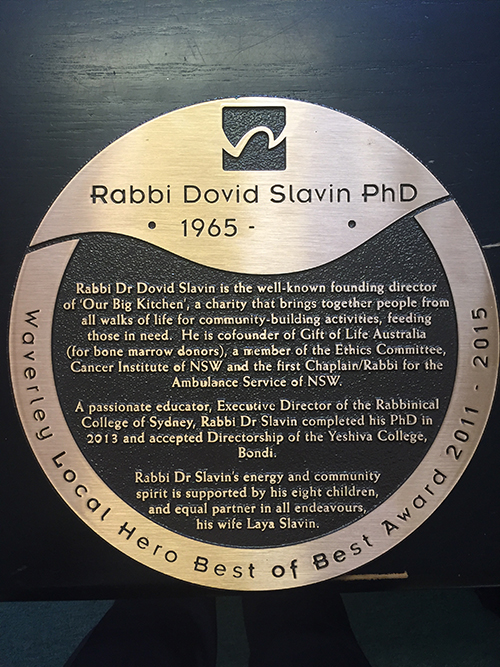 After all this, Rabbi Slavin knows who the credit for the realisation of this vision truly belongs to: "I can say, hand on heart, that anything I've achieved here and anything other have achieved here is down to Laya."